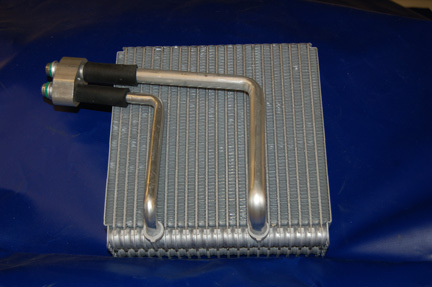 Evaporators are usually made of aluminum. They look like, and in fact are, similar to radiators, only thicker and smaller in overall size. Like radiators, evaporators consist of a series of internal tubes or “flow paths” with fins attached to them. Air can pass freely through the fins, just like a radiator. But unlike a radiator, where the internal tubes carry moving engine coolant, the passages in the evaporator carry moving refrigerant. When many people talk about refrigerant, they refer to it by its most popular brand name from years back, “Freon,™” or R-12. In the United States, Freon™/R-12 was the type of refrigerant used in mobile A/C systems until about 1994, but it was replaced with a different refrigerant in all vehicles after the 1995 model year. The new refrigerant is HFC-134a (or R-134a). In a mobile A/C system, cold, low-pressure liquid refrigerant enters the evaporator. Warm air from the interior of the vehicle passes through the evaporator by action of the blower fan. Since it’s a fact of nature that heat always travels from a warmer area to a cooler area, the cooler refrigerant flowing inside the evaporator’s absorbs heat from the warm air. At the same time, humidity in the air condenses on the cool evaporator’s surface, then eventually drips out of a drain tube to outside the vehicle (think of how moisture forms on a cold bottle of soda pop on a humid day and forms a puddle on your kitchen counter). This is why you see water dripping underneath a car while the air conditioner is on. After the (now slightly warmer) refrigerant has completed its path through the evaporator, it moves on to the compressor. What could go wrong with your car’s evaporator? Evaporator failures can usually be summed up in one word: leakage. Leaks can occur for a few different reasons. Usually, either a seam or weld has gone bad, creating a leak point, or corrosion has occurred, causing an “outside-in” failure. This often happens because leaves or other organic material enter the evaporator case through the exterior air intake vents and come in contact with the evaporator’s surface. This moist atmosphere causes decomposition of the organic materials, and can form caustic corrosive substances which can eventually perforate the surface of the evaporator. These same substances can also sometimes lead to an odor problem inside the vehicle, most noticeable when the system is first operated. Various deodorizing biocide treatments and drying modules are available to help with this problem. The evaporator fins are also susceptible to clogging from leaves and other debris. You can E-mail us at macsworldwide@macsw.org or visit http://bit.ly/cf7az8 to find a Mobile Air Conditioning Society repair shop in your area. Visit http://bit.ly/9FxwTh to find out more about your car’s mobile A/C and engine cooling system. This entry was posted in Automotive, Mobile Air Conditioning and tagged #air conditioning, #Macs worldwide, air conditioning parts, auto air conditioning, automotive, car, car care, car maintenance, engine cooling system, environment, mobile air conditioning, radiator, summer travel, vehicle. Bookmark the permalink. Finally… Someone who knows what their talking about, glad I stopped in. Nice blog BTW! You can be sure I’ll add it to my browse list. Keep up the good work! Thanks for the information I hate working on car AC units, they are always so jammed in! Very clear for the confusing people who work on A/C PARTS works and those car owners. Keep up the good share! Just who knows how to identify the quality of a/c evaporators? Very good information. My son has a 2002 Jeep Grand Cherokee and we have been having A/C issues since buying it. Bought it knowing compressor was bad. Since then, it gets charged, works well for awhile on driver side, not so much on passenger side and gradually loses cooling within 1 day. Guy I took it to said it was either switch or evaporator. He put in switch. Same issue continued. He said it was not leaking refrigerant. That it was full. I cannot fathom how that can be the case. Your thoughts? Forgot to mention, we put in new compressor right after buying it. I was looking to find out what was tbe reason for my car evaporator leakage to prevent it in the future. What deodorizing biocide treatments and drying modules are there and what is the way to apply them? Would the filters behind the glove box be enough to prevent organic materials to enter?